Refugees and migrants walk along a beach after crossing a part of the Aegean on a dinghy, from Turkey to the Greek island of Lesbos, Dec. 12, 2015. The U.N. refugee agency reports an unprecedented one million people, most fleeing persecution and war, have arrived in Europe this year. The UNHCR says the number of refugees and migrants who have made the dangerous Mediterranean Sea crossing to Europe is nearly five times higher this year than last. In 2014, nearly 220,000 people fled to Europe. It says more than 3,600 people died this year trying to reach Europe in flimsy smuggler boats. The International Organization for Migration also issued figures Tuesday showing that 1,005,504 migrants from Africa and the Middle East have crossed into the continent by a combination of irregular land and sea routes. A spokesman for the IOM, Joel Millman, told VOA that there are several factors for such a great, unforeseen influx, but the biggest is the demographic change in the Middle East. “The biggest is the change in the composition of the refugees in the Middle East, principally Syria and Iraq — people that were staying in counties like Turkey, Lebanon, Jordan. To some degree a tipping point was reached and it just became much harder for people to remain there for a variety of reasons,” he said. Refugees from Syria, which has been torn apart by a five-year-old civil war that has left over 200,000 people dead and millions more displaced, account for half of all migrants and refugees, followed by refugees from two other war-torn countries, Afghanistan and Iraq. 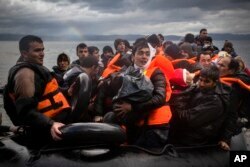 Millman said that the migrant wave is unlikely to immediately stop in 2016. FILE - Refugees and migrants line up to board buses at the Greek port of Piraeus, near Athens, Oct. 15, 2015. The UNHCR says about 80 percent of the refugees and migrants have crossed the Aegean from Turkey to Greece, which does not have the capacity to accommodate them. 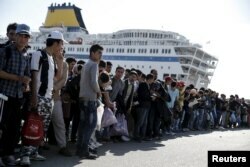 Agency spokesman Adrian Edwards tells VOA at least half the arrivals are refugees from Syria. Migrants queue on a street to enter the compound outside the Berlin Office of Health and Social Affairs (LAGESO) for their registration process in Berlin, Germany, in this Dec. 9, 2015 file picture. Edwards says people move for a variety of reasons. Many are so-called economic migrants. He says these people too need help and should be properly received. He says their cases should be looked at to see if they have a legitimate claim for refugee status. If they do not, he says they deserve to be dealt with in a humane manner, according to immigration law. But he notes the mass migration into Europe is primarily a refugee situation, which reflects the sad state of the world. FILE - Refugees and migrants arrive on a beach after crossing a part of the Aegean sea from the Turkey's coast to the Greek island of Lesbos, Nov. 28, 2015. Edwards says nations are not investing enough on measures needed to address the root causes of displacement. He says until solutions are found to stabilize the situation, desperate people will continue to flee from war, persecution, human rights abuse, and poverty in search of a safer, better life.